Female super heroines join the fight, front and center, in DC Comics Dice Masters: DC Bombshells. Lois Lane, Stargirl, Mera and other leading ladies of the DC Comics universe are an all-new, all-female special force taking on the Nazis in World War II, while facing the cultural challenges of women in society. Wizkids has announced the popular DC Comics characters are coming to Dice Masters in an organized play event. Organized play events are held by participating stores and by playing in them you can win these Dice Masters cards. You have a chance to win Mera: Queen of Atlantis (the participation prize card everyone gets), Stargirl: DC Bomshell (one of the two limited edition prize cards), and Lois Lane: DC Bombshell (the other limited edition prize card). Mera: Queen of Atlantis is new art for the card that debuted in War of Light. 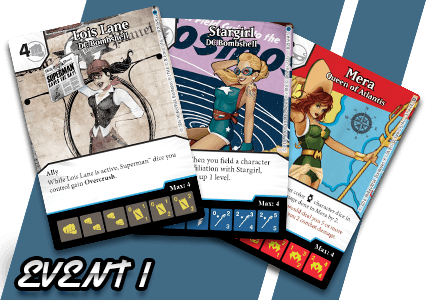 Stargirl: DC Bombshell and Lois Lane: DC Bombshell are two new cards though. Stargirl uses the die from the DC Comics Dice Masters: Justice League set while Lois Lane uses the DC Comics Dice Masters: World’s Finest die. Lois Lane is an “Ally” and while she’s active, Superman dice you control gain Overcrush. She costs 4 to purchase. Stargirl, while the full text is covered, looks like when you field a character with the same affiliation of Stargirl you can spin one die up 1 Level. The cost to purchase her is unknown. Show your support of their patriotic propaganda in the DC Comics Dice Masters: DC Bombshells Organized Play events. Check out if a store is participating in your area.